The Toronto Maple Leafs have been long rumoured to be in search of a top-four defenceman to strengthen their chances of a playoff run. 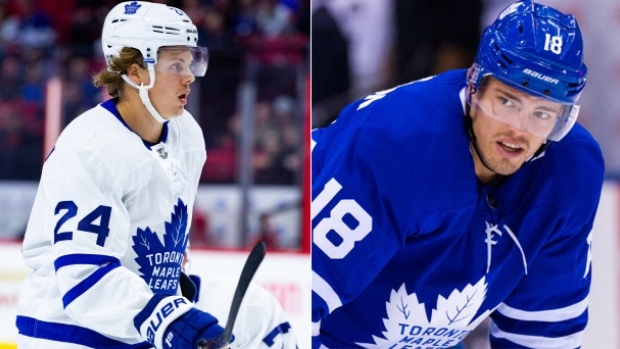 TSN Hockey Insider Bob McKenzie confirmed Wednesday that the Leafs’ first-round pick this year is in play ahead of the trade deadline, but suggested one or even two forwards could be moved for the right addition to the blueline. “If you’re gonna get a good defenceman and they obviously want to get a good defenceman, you’ve got to give up something of value,” McKenzie told First Up on TSN Radio 1050 Toronto. “And not only would the first-round pick be in play, but I’ve been saying for quite some time now – take your pick, but one of Andreas Johnsson or Kasperi Kapanen will be gone too in the most likely scenario. It obviously depends on which defenceman they end up with and how much term is left, and what the guy’s age is, and what his value is, but it’s quite conceivable that both of those pieces could be departing for the right guy. Johnsson and Kapanen will become restricted free agents in July. Kapanen, 22, sits fifth on the Maple Leafs with 15 goals and 28 points, while Johnsson, 24, is seventh in scoring with 10 goals and 21 points this season. TSN Hockey Insider Pierre LeBrun first reported about the Maple Leafs’ top pick being in play for the right price on Tuesday night during Insider Trading. Pittsburgh Penguins general manager Jim Rutherford said last week that he believes Derick Brassard has struggled to adapt to his reduced role. And TSN Hockey Insider Darren Dreger reports that the team is now expected to move him and find a better fit for the team’s third line centre. “Tis the season for trade speculation, and Derick Brassard is another name that we have to include being in play,” Dreger said Tuesday on Insider Trading. “For whatever reason, Brassard just hasn’t been a good fit with the Pittsburgh Penguins. That’s not say that he isn’t a quality centreman, on many teams he’s the No. 2, but with the Penguins he’s their No. 3. I know that Penguins general manager Jim Rutherford is at least listening to some of the interest in Brassard. The Penguins acquired Brassard ahead of the trade deadline last season. He scored three goals and posted eight points in 14 regular season games last season after the trade, along with a goal and four points in 12 playoffs games. Through 38 games this season, Brassard has eight goals and 14 points with a minus-6 rating. Rutherford told The Athletic earlier this week that he has been unable to explain Brassard’s performance since joining the team. Brassard averaged over 18 minutes of ice time in 58 games with the Senators last season, but is averaging 15:01 in Pittsburgh. Jim Matheson of The Edmonton Journal speculated Monday that Brassard could be a fit for the OIlers, who are looking for forward help. According to TSN Hockey Insider Darren Dreger, Florida Panthers general manager Dale Tallon has let teams know that depth defenceman Bogden Kiselevich is available for trade ahead of the deadline. Dreger notes that there is some expectation that the Panthers, who sit 14 points back of the final wild-card spot in the Eastern Conference, will be active in trade circles. Kiselevich, 28, signed with the Panthers in the off-season after spending the past nine seasons in the KHL. He has eight assists in 31 games while regularly serving as a healthy scratch. The left-hand shot carries a $925,000 cap hit this season and is scheduled to become an unrestricted free agent in July. As a pending unrestricted free agent on the last-place Philadelphia Flyers, Wayne Simmonds has emerged as trade bait ahead of the deadline. The 30-year-old winger has 15 goals and 21 points in 46 games this season and TSN Hockey Insider Pierre LeBrun believes he could benefit any contender in a Stanley Cup run. “I think any team that thinks they can win the Cup this year, adding Wayne Simmonds would be a hell of a finishing touch. I love that guy,” LeBrun told TSN Radio 1040 Vancouver on Tuesday. “Those players are few and far between as the game continues to evolve in terms of the intimidation factor within an athlete who is also a heck of a player. He scored a beauty (Monday) night. “And I will tell you this: I wrote about it last week, and yeah, I do agree he’d be a great fit in Boston. I think there’s lots of guys I could see in Boston that would make sense. Because the Bruins are calling around, and I do think they want an upgrade, particularly on the right side. For example, if Jakob Silfverberg doesn’t end up re-signing with Anaheim, I wonder about him. There’s lots of guys, probably like a dozen names I can give you, that would make sense for Boston. “But you know where I’d really like to see Wayne Simmonds is in Tampa Bay. I know what you’re going to say. It’s the last thing they need is a forward, but I’m going to tell you right now that I think there was certainly some hesitation within the organization the way they kind of meekly went out to Washington last spring. And I think part of it is the Caps pushed them around. And obviously you’ve got Tom Wilson on that Stanley Cup championship team that is quite a wildcard himself, in that he’s a great player but also he’s scary. Well let me tell you, if those teams happen to meet again at some point down the road in the playoffs, having Wayne Simmonds on your side wouldn’t be a bad thing if you’re the Tampa Bay Lightning. Micheal Ferland’s name has been circulating in the rumour mill throughout the New Year as the winger continues to play out the final season of his current deal. TSN Hockey Insider Darren Dreger reported Tuesday, though, that the Carolina Hurricanes still hope to re-sign Ferland, who has 13 goals and 25 points in 38 games this season. Ferland was acquired last summer from the Calgary Flames along with Dougie Hamilton and Adam Fox. He scored a career-high 21 goals and 41 points in 77 games last season. The 26-year-old carries a $1.75 million cap hit this season, though Sean Civian of The Athletic reports Ferland is looking for a “significant” raise and could be looking for a number close to Tom Wilson’s $5.17 million salary with the Washington Capitals.